Okay this is totally one of those posts where I give you a little something and I hope you give me a little something. I need some major suggestions on books that help get boys to enjoy reading. More specifically - Cute reading. We've found a few books here and there that he seems into, and I'll share those, but I am up for any and all suggestions you guys have got! This is Cute's last week of first grade and all year we have been on the struggle bus when it comes to encouraging him to read. Don't get me wrong. He loves books and stories, and being read to. But when it comes to reading himself? He has other more important things he feels he has to do. If school were based on Lego building skills, ability to score soccer goals, solve multiplication problems, drawing ninjas with friends, or running the fastest during P.E. he would be an ace student. He excels in all other subjects, and I know he'll get there at some point. Reading is life skill you just need, kind of like tying your shoes (and that's a subject we'll save for another day), but he just feels zero desire to take any part in it. So in the spirit of the "summer slide" I was hoping to get a little insight into what books you might suggest to keep him motivated. I have stumbled upon a few these last few months that seem to keep him interested and a few he gets excited about. So maybe this can be a bench mark for suggestions too? I can't be the only mom on the struggle reading bus! So share any and all - you never know who it might help! 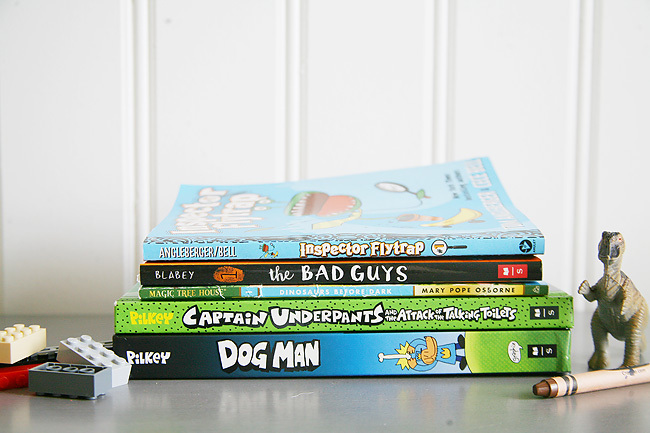 Dog Man Series - This series is written by the same author as the Captain Underpants books, so a similar type of humor, but with less actual potty talk. It follows a police officer who is half dog/half man and his crime fighting adventures. The pages are filled with comic style photos and Cute loves the flip-o-ramas included. So far this seems to be the series he's gotten the most excited about, and he's already excited about the Lord of the Fleas that comes out this August. The Bad Guys Series - This series is fun! This follows the notorious "bad characters" of various tales (think Big Bad Wolf), and changes it up a bit. 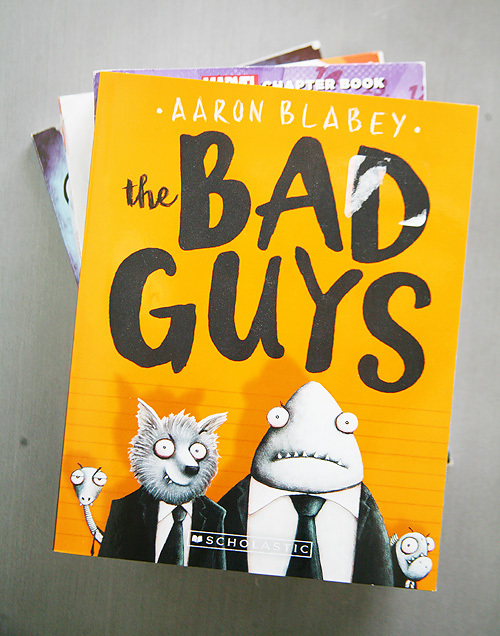 The bad guys all team up together to do good deeds, and each story follows their mishaps along the way. Cute has a few books in this series he grabbed from the book fair and even though there are less photos he still enjoys reading them a ton. Inspector Flytrap Series - This one we recently grabbed while running errands. It's a mystery series where the main character is a Venus Flytrap. It seems funny, but Cute hasn't sat down to read it through it's entirety. It has a few pictures in it, and tons of silliness so hoping he ends up liking this short series too. 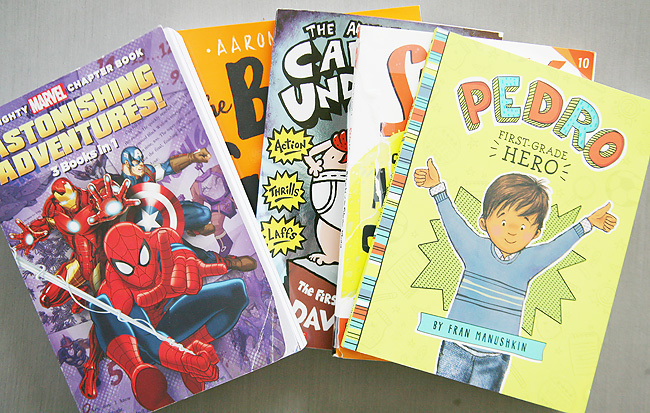 Mighty Marvel Chapter Books - We've had these for awhile, and while some of the words are tough it's a super hero book and in some boys' world that's all they need to motivate them. Cute loves look at these over and over and his teacher let him keep one in his desk all year to read whenever he liked. Magic Tree House Series - Several people have suggested these to me, and my mom purchased a few of them for Cute. I know there are tons of books in this series, and while Cute likes these being read to him, he hasn't been consistent quite yet on reading them on his own. There aren't as many photos as there are in other series so that could be the drawback? The Stink Series - Cute owns one book in this series, and he reads through it often, but when asked he doesn't seem interested in looking at another. The book series is based on Judy Moody's little brother, and follows him on some silly adventures. A super funny little series! Pedro Series - Cute originally grabbed two of the books in this series because one is about being in first grade, and one is about soccer - two of his main interests this year. The book series is cute and kind of showcases the main character, Pedro, in some scenarios that make him uncomfortable and shares how he handles them. Filled with great messages for this age group! 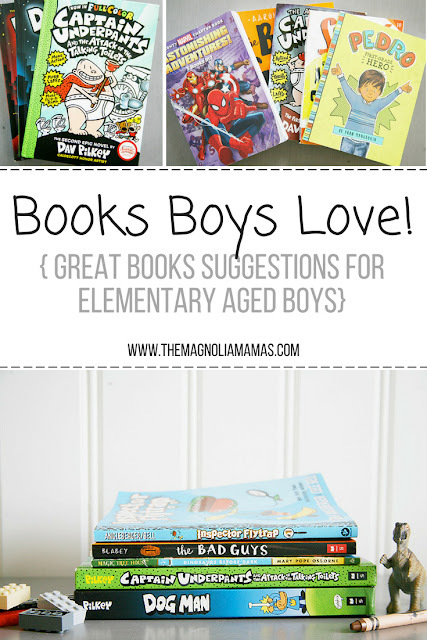 Okay, that's all I have in my boy book arsenal. What are some of your suggestions? At his age, I would suggest the Mighty Robot series (also by PIlkey) and the Black Lagoon series. Reading didn't really click for Finnan until 2nd grade and now he reads more than any kid I know. Good luck! Thank you! I should have asked you my fellow reading friend! I'm hoping it "clicks" this year or I'm nervous it's going to be a struggle as he gets older and how fast paced schools move now. I'm going to check out these suggestions now that we are home and settled for a bit! Thank you!! !